Re: Tamora~ The forgotten world. Jordan was on the verge of going outside to see what she could do to start the process when a new arrival came; she never expected it, nor did she expect as she assumed the Hermes was to arrive so soon. She stopped. "You'll have to tell me your orders Chief for as of this moment we've been out of touch from Atlantis for two days. I'm presuming you are Navy, therefore Chief Petty Officer am I right?" Cooper watched the figure approach and recognized her from photos..."Yes, I am Ma'am! after my last off-world mission, I was booted off SG-1, because I was overly eager to see Atlantis! I asked about testing for it and I was told that that should have been done some time ago. I was a bit more excited and then I was told that my wish had been granted and that I was off SG-1. Surprised didn't even cover my feeling then. Then the Colonel walked up to me and ripped my patch off and ordered me out of the room . After a second, he said he would have the guards throw me out. The Admiral gave me another shot & thought I would be better placed here with you! Maybe I was too gung-ho,maybe its a Navy/Air Force thing,I don't know. And yes Ma'am, Chief Petty Officer and, a S.E.A.L. I couldn't find a better place to be than here, on your team! "..saying this with his wry smile, for her benefit. "Cut the ma'am. I'm too damned cold to acknowledge it Chief." Jordan told him through half chattering teeth. "To me it seems like you probably were just far too over eager for a team like SG1, that doesn't mean Chief I don't expect the same standard. The Admiral has given you a second run at it, don't blow it. I'd tell you to chill, though as you can see and feel around here that'd be a pretty dumb thing to say wouldn't it?" They were wasting valuable time now, with the arrival of the Hermes they were able to step things up. "Very quickly then. These are your teammates. The pretty woman there who looks like Julia Roberts is Doctor Guilia Montale, our Science officer. Next to her is Corporal John Valentine our Marine shooter, over there is Lieutenant Jon Hope my two IC and second pilot when we have our own ride." She couldn't see Teyla anywhere then remembered she went to help the locals doing something. 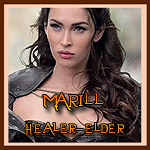 "Our good host here is Marill, she is the village leader and healer." At that point she stopped talking for one second. Long enough for Marill to say something at least. "How do you do Chief Morgan, another willing hand to get all this sorted out. Jordan how do we start doing the move? It can't be an easy thing can it?" Jordan looked up to where the Hermes was most likely above them. "No it isn't Marill. I need to know, do you have a flat field somewhere about as long as this road we came in on, and as wide as your village?" She was figuring on the size of the Hermes, knowing that they can land if needed. It would save a hell of a lot of trouble. "Hmm." Marill thought "There is the 'flats'. A large tract of land just behind the village to the south. We don't have the same thoughts of time or measurement as you do, so the best I can say is that you can see it from the little hill twenty strides away from this hut. When you look down, you're looking directly at the nearest boundary of the flat. It is twice the size you need." "That will do. Right people, get some rest. At first light we start to get things done." "I'll start getting the word out to the people for you Jordan." Marill told her, the woman would stay up all night if she had to. Cooper did as he was ordered, but it didn't require too much effort. He had been beamed aboard the Hermes, set up with gear and got to have some 'borscht?' and a few other tid-bits. It had been an interesting start to his new billet and he wasn't going to goof this up! The room was warm and the combined heat from the various bodies present felt good after the cold outside. "Do you mind if I take a seat? Its been an interesting day, so far! He checked his kit to see what sort of rations were there and found some sealed bread and cheese, some sort of dried meat or fish and a container of..Borscht! Grinning, Cooper sat back by a corner of the room and observed his new team! But, there was an errie silence in the room and as he looked at his new team-mates and at the Commander..Cooper realized his gaff! !Quickly standing up he quickly found his new host and corrected his stupid blunder..."Ma'am, I apologize to you for my manners, but even the cold is no excuse for not replying to your Greetins! Yes, I am a newly arrived addition to this team and I hope to earn their trust, as well as yours and I will do my best to aide everyone involved here. I ask for your pardon! Jon had been sitting for too long to a point of not feeling anything, even in his extremities. Focusing his attention to the newcomer that just beamed down along with the supplies from the Hermes, he exhaled a cold breath of air. Another poor sod invited late to the party I see... he thought to himself. Observing his talk with the CO, the lieutenant realized how green and chipper this guy appeared to be. Even in the cold, Cooper seemed to find the fun in it. Overhearing their conversation, Jon picked up on a few things. When Jordan finished her introductions, he spoke, "Take it easy, Chief. Take a breath. We are here to help these people. We can't do everything at once, but we will do our best to move it at a quick pace." Pausing slightly to ponder as he looked around, Jon whispered to Cooper, "Chief, I couldn't help but overhear. You said you were kicked off your team? Do you want to talk about it?" Of course, it was probably a weird thing to ask. Maybe it wasn't the right time to ask that either. Listening to Jon, Cooper gave him a grin and replied.."Thanks Jon, after I feel like Ive caught up a bit with everyone, I might take you up on that question! Im going to be focusing now on catching up with the 'here and now', but..perhaps and Thanks! “How you doing, Marill.” he said trying to be friendly despite the cold. He wanted to keep moving, staying still meant more cold. He wondered if maybe they had something here in the kitchen that could warm him up. Everything seemed somewhat alien. “Do you have any idea what hot chocolate is?” he asked the healer, wondering if she could heal the cold. When Jon heard his first name being said, he groaned silently nursing his jaw with his thumb. Quickly hiding it, the El-Tee cleared his throat for a sudden and responded to Cooper, "Chief. Maybe when we are off duty, you can call me by my first name but for now, Lieutenant will be fine." He sighed unsure if Cooper knew exactly what to call their superiors with a proper tone. This mission would probably be Coop's test, but for now the cold just made Jon numb to a point of not caring too much. Turning to Valentine, Jon stared when he asked about the hot chocolate. Catching himself, he shook his head and turned away to mumble in his British accent, "Hot Chocolate? Well, let's see. I'd like Hot Tea. What kind of leaves do you have on Tamora. Wait, scratch that. I'll take hot water. It's no trouble. Plenty of ice around here to melt with." Jon sighed. Already Valentine was questioning the cold and complaining about it. Realizing he had this cranky tone on, he turned it around into a more mature tone to his team, "Alright people, you heard her! Get some sleep. No complaining. We got our duties. Dismissed." From the tone of his Commanding officer, Jon knew she was right. They were wasting valuable time. They had to get going. Turning to his CO, he responded, "By the way, Commander. I volunteer to take a few people and scout out that piece of land Marill mentioned first thing in the morning." He was cold and tired, but he was willing to make a step up. There was a lot to do. Cooper heard the last of the conversation..he thought that that was a good idea! Moving towards the L-Tee, he said "L-Tee, if I can volunteer for this new mission and help checkout the site, I also think that its good planning! Ive got my sniper rifle and two 'long-guns' will serve us better than one. We can have two vantage points and also watch out for each other, in case there is any "enemy" activity. After getting it fairly clear to the team that scouting out the area was totally unnecessary due to the fact that this was the Tamoran's home and the only hostile thing they were likely to face was a surly CO. A surprise was in store though before they finally turned in, when Jordan arranged for the Hermes to beam down some tins of Milo and cartons of long life milk. Not only was it soothing for the team but Marill and a few of the locals found it rather wonderful (if a little sweet for their tastes) as well. Sleeping for the team was arranged in the Long House, that place normally set aside for the Elder's meetings. A brisk fire was set either end of the large building with proper Arctic sleeping bags provided from the Hermes in place of the ones they had brought with them. Just prior to sunrise which in fact didn't really show up as the sky was covered in thick dark cloud, a quick breakfast which was shared with the Elders of the standard Earthly porridge with bacon and eggs to follow. From that point on it was all go, go, go. They had to work quickly as it was feared that a severe snow storm was on its way in less than 10 hours, so in that time they had to move over 3,000 people (to be exact from the 3 villages it totaled 3,564) and their Drafts onto the Hermes. The ship had landed during the early hours after midnight, so when the team arrived at the LZ, it was already ablaze with the ship's arc light illuminating the entire area. Teyla and Marill were coordinating things within the ship, working closely with the Hermes' load masters. For the most part it was going smoothly with only a few issues with frightened children and some of the elderly not too keen on 'traveling' between the stars. All that left was for the team to work with some of the young herders along with Yorvis and his father Yatar in getting the Drafts into the pens provided for them. This wasn't a simple task as the natural wandering instinct of the animals wanted them to do nothing more than head south. A simple solution was found when it was by complete accident, discovered the Drafts had a taste for carrots. The ship carried a fairly decent stores with them, so with typical human endeavor a line of tempting orange colored delights was laid out all the way into the interior of the ship. Jordan stood on a platform that had been hastily rigged along the line leading into the ship, from her vantage point she could see practically everything and what she couldn't see she was getting relayed updates over the radio from her team. The last of the Tamorans were filing in with the last of the drafts, a line strung out over roughly 500 meters. She called them up. "Team report." She had placed the three men of her team at the rear of the line making sure any stragglers didn't fall behind. "See if you can hurry them up, I'm afraid that storm maybe here sooner rather than later. Agathon, Morgan and Valentine get that tail end in tight, they're starting to wander off the line." Cooper hadn't done 'crowd controll' for quite some time. But, these people were in some extreme danger and he felt for them. Losing their homes and being up-rooted at the same time must be a strain for them. He looked at the villagers ahead of him and tried to comfort them, but to also encourage them to try to move a bit faster, especially with the on-coming storm, which was getting closer and was building up. "How are you all doing? He knew that the question might sound strange, but he tried to convey the need for speed and for the concern of his team for their safety. "L-tee, I understand how hard it can be for them, but might you have any suggestions on how to better 'motivate' them?? Jon looked behind him as he walked forward across the snow. Geared up once again in his cold winter gear, he shivered slightly hoping that the cold would go away soon. Something was creeping across him that left him colder than before. He wasn't sure what it was, but was hoping to not get sick of all days. Jon understood from the other day that scouting wasn't necessary. He may have jumped the gun a little bit. Looking up in the sky, in the distance Jon thought he saw some dark clouds forming. It wasn't dark as it was just morning. It just meant he didn't like the looks of things. Maybe it was the cold getting to him. Snow crunched beneath him as the team XO walked along the ground with his team. The line of people heading toward the ship were long. From the distance below the ominous clouds was the Hermes. Jon sighed. As much as he hated this planet, the boy inside him loved the snow. He wanted to come out and play. Make some snowmen or do snowball fights. Covering his mouth, Jon coughed several times and sniffed. Looking at the line from the rear, he had noted several people veering off slightly. Tapping the radio, he responded, "Yes, Ma'am. I see it." The radio crackled at the interference from the air started to crumble the radio waves. Turning to Cooper, he answered the man's question with a blank stare, "They are losing their home, Chief. That's motivation enough." He was almost sad as he felt for the Tamorans. Turning his attention to the line, he focused his energy on them and finished, "The only thing we can do right now is make sure they all get on board the ship. Remind them that they are going to a better, safer place." They might weather the storm in the past, but in the present their future was at stake. He saw the simulations back at the ship. As the team XO, he directed both Cooper and Valentine to focus on their objective, "Alright, you two. You heard her. Make sure they stay in line. Be gentle and remind them that we're here to help. Usher them quickly. We need to leave soon. Morgan, keep an eye on the rear." Jon sighed while walking a little faster. Seeing one of the kids venturing off from her mother, he gently took her hand and led her back to her mother speaking softly, "Hey. Don't wander off. Stay close." He didn't know if they felt it, but the wind was growing stronger slowly. Soon, it might become bad. Cooper heard the L-Tees response and re-doubled his efforts. The winds were picking up now and he knew that the Tamorans were making 'best speed' in getting to the ship and to safety! "Aye Sir, I'll fall back a bit so that the people don't slow down. And I'll be sure to re-inforce our message that we are here to help. Turning back and scanning the ranks of the people,Cooper thought he saw some wavering..walking back to the last few people, he simply said.."Please try to keep up, we are getting closer to the ship and once there, everyone will be safe and out of this storm. We will have warm foods and blankets and we will see to your needs there. As soon as all of your people are aboard, we can make ready to leave this place and we will be able to take you to a new home! I have a couple of canteens of water, if anyone needs a drink! Another hour passed by with the wind picking up considerably but by this time everyone was aboard with several head counts done by the village elders. Marill had joined Jordan at the loading ramps with Teyla soon meeting up with them. The three woman standing fixed looking out at the Tamoran's former home, all three now wearing the white Arctic suits supplied by the Hermes with their fur lined hoods pulled close around their faces. Jordan had her team there as well, she spoke to them hoarsely as the cold and wind had affected everyone's throats, it was now difficult to talk but she managed it well enough. "All of you put in a fabulous effort today, it will be recorded just to let you know. But our work isn't done yet. Once we're back at Atlantis, we'll be scouting a new location on the Mainland for these people with Teyla's help. But in the meantime, give yourselves a pat on the back, then go up to the crews quarters, shower, eat or whatever you need to do and then get some rest. That is an order." He last action was to activate the closing of the ramps, then letting the Captain know they were ready to leave. It was a tad bit hard as Jon pushed in against the increasing hail winds, but he made sure he was the last onboard. Checking to see if every Tamorans were onboard, he made sure the other two men were ahead of him and pushed in the last Tamoran onboard before almost collapsing from exhaustion. Pressing his hands against his knees, Jon was bent over for a few moments listening to the Commander's praise on a job well done. Just by hearing her voice, he knew she was having trouble speaking because of the winds. Sitting up straight, he tried to speak but couldnt get a few words out. Raising a hand, he saluted her and rushed out toward his assigned quarters to take a break. His throat hurted from all that strain against the harsh winds. Never before he felt a storm like Tamora. Not wanting to ruin his vocal chords, he elected to not speak for awhile at least till he got a proper warm shower and a snack.